The growth of marine traffic in harbors, and the subsequent increase in vessel and propulsion system sizes, produces three linked problems at the harbor basin area: (i) higher erosion rates damaging docking structures; (ii) sedimentation areas reducing the total depth; (iii) resuspension of contaminated materials deposited at the seabed. The published literature demonstrates that there are no formulations for twin stern propellers to compute the maximum scouring depth. Another important limitation is the fact that the formulations proposed only use one type of maneuvering during the experimental campaign, assuming that vessels are constantly being undocked. Trying to reproduce the real arrival and departure maneuvers, 24 different tests were conducted at an experimental laboratory in a medium-scale water tank using a twin propeller model to estimate the consequences and the maximum scouring depth produced by stern propellers during the backward/docking and forward/undocking scenarios. Results confirm that the combination of backward and forward scenario differs substantially from the experiments performed so far in the literature using only an accumulative forward scenario, yielding deeper scouring holes at the harbor basin area. 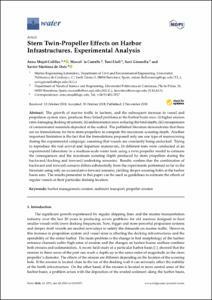 The results presented in this paper can be used as guidelines to estimate the effects of regular vessels at their particular docking location. Mujal-Colilles, A., Castells, M., Llull, T., Gironella, X., Martinez, F. J. Stern twin-propeller effects on harbor infrastructures. Experimental analysis. "Water", 2 Novembre 2018, vol. 10, núm. 11, p. 1-14.